As I have mentioned elsewhere, I wouldn't really count Roy Lichtenstein as my greatest inspiration, but rather John Romita Sr. who did most of the Spiderman artwork in the late 1960s and 1970s. There was just a nice way that he framed the action and I just like the way his stuff was drawn. When you compare more contemporary comic drawing to that of the Silver Age, it's like comparing the names of football teams of the NFL to the football team names of the XFL. Contemporary comics would be named the Los Angeles Xtreme, the Memphis Maniax or the Orlando Rage. To me, contemporary comics try too hard to be over the top X-Games inspired. One has to wonder how well they will stand up to the test of time. But anyway, as you all know, my schtick it doing political satire in comic painting form and this was my homage to Spidey. 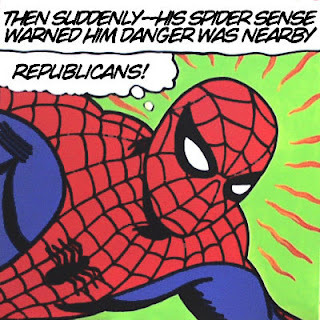 It's pretty much taken right from the panel of one of the most famous issues of Spiderman of all time. It was issue #122 (I believe, though I'm not sure) where Gwen Stacy dies at the hands of the Green Goblin. For those of you who only know the movies, Gwen Stacy was Spiderman's original love interest while Mary Jane Watson was just "a friend." At the time, all of this was quite shocking. A main character? Killed? Unthinkable! Besides, she was just so damned hot. Who didn't have Gwen Stacy fantasies?!? Did I Happen To Mention That I'm Fully Action-Posable? Once in a while I'll get a really strange idea for a painting. I was watching some kind of commercial a while back and in it they used the phrase "fully action-posable" and I thought to myself, "gee, that can be take a few ways." I then had a vision of a Barbie© saying the same sort of thing and the idea of this painting was born. I was giggling the whole time I was painting it, though that means nothing. I often giggle to myself. As an aside to all the very hard-working and not at all meddlesome lawyers at Mattel, any similarity with actual commercially available action-posable dolls is purely coincidental and I in no way meant to infringe upon any of your so very well protected copyrights. Ditto to Britney's lawyers, though she's not quite as action-posable as she may once have been. Ever since the election of 1980, there appears to be a significant difference in voting behavior between men and women. It turns out that women are a bit more likely to vote for Democrats. Lesson learned? If you're wanting to schmooze the chicas, and unless you're at a pro-life rally or an evangelical revival, you're best off not quoting your favorite Rush Limbaugh witticisms. Dude, if she brings up the importance of universal healthcare and you're convinced it's a Hillary Commie plot? Let it go! Just let it go! Sometimes I try to be too cute when I'm coming up with a concept for a painting and people stare at it for a while, give up and say "I don't get it." This painting stayed in a gallery for a little too long because there were just too many people who didn't understand it. Nobody wants to buy a piece of a joke that they have to have explained to them. The potential buyer usually feels foolish because they didn't appear clever enough and try to cover for this by saying that they got it but that it just wasn't very funny. The joke here is that Melissa, our heroine, is not too keen on Brad showing off in his tie his political preferences(click on photo for bigger/easier to see version). Eventually someone saw it and got it immediately, snickered and wanted it. Now it's sitting in an office of a lobbyist for a left-wing, hell-bent-on-destroying-American-values organization in downtown Washington, DC. 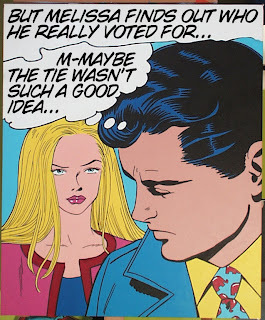 The caption is a little bit of a play on Roy Lichtenstein's 1965 painting "M-Maybe" that is in the collection of the museum Ludwig in Cologne (Köln), Germany. 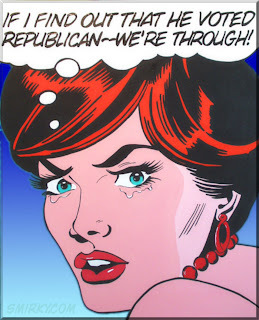 M-Maybe Lichtenstein, in turn, used some comic book art by Tony Abruzzo as his...inspiration? I actually finished this painting a while back, but with the political season upon us I think it's appropriate to let the world have a look, don't you? I must confess, I once ended a relationship because of party affiliation. Mind you, she was hot...and passionate. But honestly, she was a little bit too passionate for me. Too passionate for the other guy. After a few beers the topic turned, as it always does, to the preemptive use of military force. There was something about the way she said "nuclear proliferation" that just stuck in my craw and that was that. Once in a while I'll do something entirely for fun that has nothing to do with anything else I've been doing. 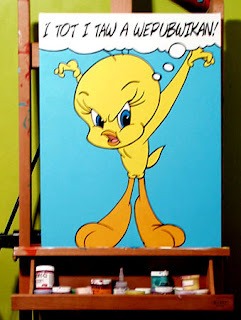 Introducing Tweetie: hero of the working class and tormentor of the predatory feline, who obviously represents the cruelty, greed and mendacity of the bourgeoisie. Of course Granny represents a fatherly Marx-like character, and it's at this point that the analogy completely falls apart. Sometimes you just don't know what will drive a crying girl to tears. Will it be heartbreak? Will it be tragedy? Will it be the prospect of having to forego that next pair of Manolo Blahniks? I know, life can be so cruel, can't it? I know what else you're thinking...the colors are different. Yeah, they are. Changing the color isn't really so hard as long as you are going darker. You can just sort of, you know, cover stuff. The black is really easy to go over to. I mean black stays, well black. I was reading that deep red and magenta together was the "new hip color scheme" for 2007. So deep. So romantic. So sensual. Really, I have to stop reading Elle. Hey, back off dude! Some of the coolest ads with the coolest poses are in there. Now if you'll excuse me, I have to go punch someone in order to prove my masculinity to all you haters out there.